Kenneth Burke is the marketing director for text request a B2B text messaging software company in Chattanooga. He runs a boutique marketing agency where he helps many companies of all sizes with their marketing and content strategies. And he’s been awarded for work in psychology research and sales. On the website textrequest.com, and it says text messaging for small businesses, start texting with your current business number and you can reach four times more people and get more leads and increase revenue. Could you explain to us how that really works? In the 3 to 4 years that you said your startup has been in operation, can you tell us some of the industries that predominantly tend to use your service? What are some everyday solutions that you believe can help to improve customer experience in small business? As a consumer yourself, what’s one thing you look for when you shop with a business, what’s your number one thing you’re looking for a business to have? What’s the one online resource, tool, websites or app that you absolutely cannot live without in your own business? Kenneth was asked to share his journey and he started by stating that Text Request is a startup. It’s about four years old now, three and a half and he got into it because one of his good friends was one of the people who helped to start it. So, Kenneth was at a sales position somewhere else, he was looking to get out of it, just wanting something new and different. And his friend was super excited about this idea and the concept and starting things off and he thought you know what, I want to be a part of that. So, that’s how he got here from his previous job. Before that, he has a degree in psychology with a focus on experimental research. And that’s how he got here, and he has done some consulting on the side as well. Kenneth explained how “Text Request” basically works as he stated that it starts with a basic concept that these days most people are thinking consumers, most people don’t answer their phone calls and don’t reply to e-mails like they used to. So, depending on what industry you’re in and then even within what company rates for phone calls are anywhere from 5% are answered to up to 20%. Twenty percent is definitely the high bar there. And then according to “Constant Contact” the average e-mail open rate is only about 18%, that’s not even including responses or click through’s conversion. So, there’s clearly room for engagement there and what we found is that most people in their studies and stats to back this up, most people want to text with a business. So, what we do at “Text Request”, we give people a platform or a dashboard where they can text back and forth with customers really easily. But the reason it’s so successful or why it works so well is because people actually read their text, so 99% of texts are read, the response rate is about 90 seconds on average, so the reach rates four times that or maybe five times that of e-mail and then you’re actually going to get engagement and get responses because it’s what people want these days. Yanique stated that it’s interesting the way it’s explained because most businesses are also on Social Media. Social Media also has a platform for texting, so Facebook as Facebook Messenger. Instagram has Instagram messaging where you can directly message the business or the person depending on the type of business they are. So, why would they choose this platform versus those platforms that there’s already interface of what the business is about, the products and services they have to offer, maybe even read feedback from other people who’ve interfaced with that particular product or service. Kenneth stated that in general mobile messaging, any message you get from any platform is huge these days, it’s just what people prefer. Facebook Messenger is kind of its own thing; a lot of people use it and it works really well. Text messaging is the basic communications tool and it works really well or meshes. It can work with your Instagram, it can work with your Google business listing and your search ads. And with your website or anywhere else online where you can control phone number. So, that’s a big part of it, from the consumer side, they can go to your website search for you online and if they’re on a phone they can just click and send you a text pretty quickly. And all of it comes to the same place which is easy for a business to manage. And then a lot of times too a business they’re the ones trying to initiate the conversations. So, for them there might be a few dozen or might be several thousand customers or members or volunteers whoever it is that they’re trying to keep up with and communicate with and text which is one place to do that’s really nice as opposed to going to all of your individual apps to message someone. When asked about the industry that predominantly tend to use his service, Kenneth stated that there are a bunch of them. Everyone texts for 100 reasons, so, every business can find a way to text. Staffing is a big one, so staffing agencies have hundreds if not a few thousand employees on their roster so to speak that they’re communicating with and trying to fill positions with clients and things like that. So, texting everyone is a lot easier or sending one message to everyone even is a lot easier than individually calling each person on the list and leaving a voicemail etc. Home service companies is another big one, so you think of maid services, cleaning or plumbing, electricians, companies like that – they are always needing to check that the person is going to be home or at their business for them to come by and make sure the doors are unlocked and even that quick scheduling of an appointment. A lot of times it is easier for them because a consumer a lot of times can’t answer phone calls during the day while they’re at work but they can send a quick text so that ends up working out really well. Yanique stated that is sounds like it’s predominantly more service-based businesses rather than product-based business to which Kenneth agreed. Yanique also shared that in Jamaica where she lives, 74% which was the last statistic of GDP comes from service-based businesses. So, a lot of organizations are not necessarily into new products or manufacturing per say but more the core of their business has to do with providing a service to the consumer. Would you say where you are in the in the part of the United States that you are that maybe most of the businesses are also in that same realm or would you say it’s the opposite? Kenneth stated that it’s hard to say. He doesn’t know the stats on it. The people he comes into contact with professionally day to day, week to week – most of them provide some sort of service. They might be accountants or a home service industry or something. Their particular area does have a lot of industry manufacturing but most of the small businesses around here are service based. Kenneth stated a few of the basics a business owner can utilize as everyday solutions to improve their customer experience, a fast and accurate website. Most people are going online to find out who you are, information what are your business hours, what are your reviews. So, making sure that it’s easy for them to find and that all the information is up to date is really important, particularly if you have specific business hours, there’s a lot of times with holidays or things change where there is something inaccurate on your listing and that turns away business. So that’s a big one that a lot of people particularly they work with a marketing agency for their listing that they just overlook. Another one he thinks is just talking to your customers. It’s simple, it’s even obvious. A lot of times businesses and business owners particularly entrepreneurs, they get started and you have this idea of here’s who might our customer is and here’s what exactly it is that they need. But then you get into it and you find out that people aren’t flocking to my service or my new product as much as we thought they would. Our marketing must be wrong or something or these people must just be dumb but it’s usually that there’s just the disconnect between what you’re providing and what your customers actually want and so, in their experience, having conversations day in and day out with dozens, hundreds, thousands of people helps you to really internalize what they’re trying to accomplish and the way they want to go about it. And then you build those relationships and once you have those relationships you begin to empathize with them, you begin to think the same way that they think. And from there the service you offer, the customer service you offer, specific services and the entire experience starts to really come together. Kenneth stated that for him, it’s what’s going to be easiest usually. There’s always so much going on, there’s always going to be someone who has a cheaper option, there’s always going to be someone who has a better option. So, for him it’s just what’s the quick solution I know he’s not going to regret. Yanique reiterated that as a consumer, he’s looking for something that requires him to exert as little energy as possible but something that won’t cost him too much in terms of that it’s quick but it’s also efficient. 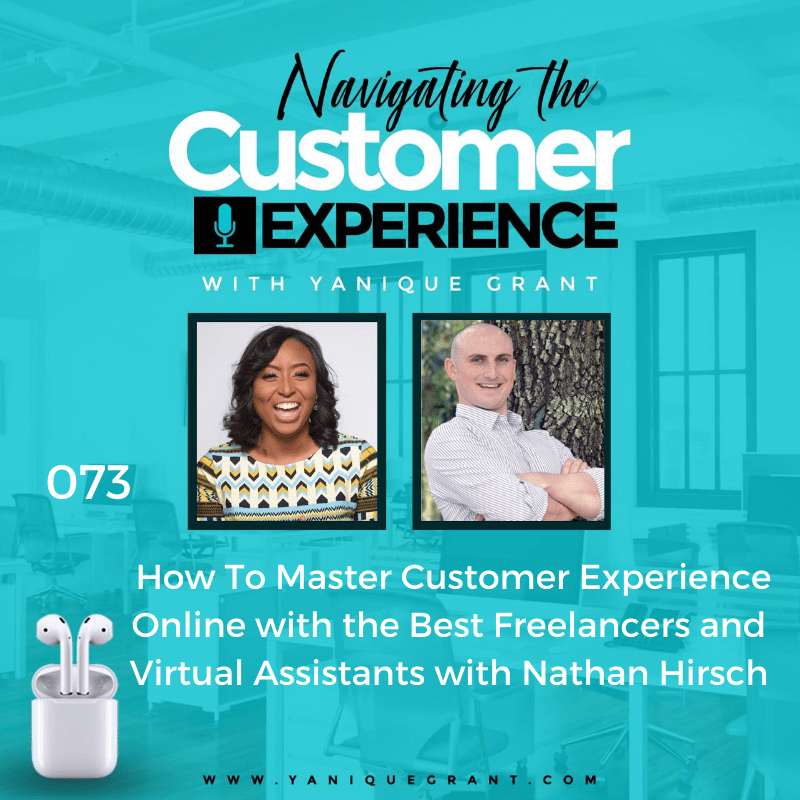 Yanique also mentioned that over the years in interviewing different people in different industries across the world for this podcast, she really has found that most consumers nowadays are seeking an effortless experience, they’re looking for that organization that can take the effort out of the experience. Because there are so many other competing activities that you have to do on a daily basis. Take the effort out but at the same time ensure that they are achieving the goal that you’ve set in terms of achieving. So, whether it’s buying a shoe or getting your carpet cleaned at home or getting a room painted or getting your website with a web developer, it’s efficient. But you have to exert as little energy as possible because this person is just so able to meet your needs in such a very easy and effortless way. Kenneth agreed and stated that it’s the people who make it effortless are the companies who make it effortless are the ones that stand out. Kenneth stated that for the online resource or app that he couldn’t live without in his business, it’s hard to say because he uses so many. It’s kind of like if one was gone, there would be another one to take its place. He stated that their content management system is the biggest one, so WordPress for a while they just switch to Umbraco. For them that’s the biggest thing because they’re always adding pages and changing copy and adding sections to our website and customer profiles, case studies and all these things. So just for him to just be able to jump in and make those changes 18 times a day is really helpful. Aside from that he would say probably the Mozbar Chrome extension. So, that basically it’s a browser extension for Chrome where you can click on it while viewing any other website and see what it’s domain authority is, how it kind of its backlink profile and some other search engine optimization key metrics which for a lot of what he does is crucial. Kenneth shared that it’s always hard to pick books because there always so many and whenever you read one thing it tends to build on something else you’ve read. Tim Ferriss’ The 4-Hour Workweek: Escape 9-5, Live Anywhere, and Join the New Rich for him was huge. It was it was kind of the first book on entrepreneurship run anything related to life and work that didn’t involve just being in a corporate office all day, that he read which for him at the time he read it was really impactful for framing how he wanted to go about his day to day. The book Rest: Why You Get More Done When You Rest by Alex Soojung-Kim Pang was really big for him. In America in particular we have this mindset of like “Oh, you have to hustle, hustle 24/7” if you’re going to give anything, it’s kind of, he calls it the “Gary V approach” and so this book is a scientific very well documented account of how the most successful people in history or at least some of them have prioritized rest over the grind. So, some people who are included in it are like Thomas Jefferson and Bill Gates and it talks about whenever you focus on rest and not just like vegging out in front of a TV or getting a lot of sleep although sleep is important, but rest as in doing other activities that stimulate different parts of your brain. So, even in college this was common, people would say, “Every 45 minutes you study, make sure that you spend 15 minutes doing something active.” It’s kind of that back and forth of activity switching without trying to multitask. So, that was big and it kind of put some thoughts he had been having and some things he’d experienced before in one book that had all the references, all the resources, all the studies and the big names in it. So, I recommend that to everyone. And then the book Peak: Secrets from the New Science of Expertise by Anders Ericsson. For listeners they don’t know, Erickson is the same one who did the research that Malcolm Gladwell ended up coining into the 10,000 hours. He loves the book because it’s like a 30-year history of everything this man’s done and everyone else in his field has done in just a few hundred pages. But he loves the concept in it that the brain really never stops growing, that it’s incredibly elastic and that counter to the current believed your brain is done developing by the time you’re 25. You can keep pushing and keep growing and keep improving in different areas. You can’t really teach an old dog new tricks. Kenneth stated that the one thing he would say is you can often do more with a few people who are really invested than with a lot of people who aren’t. Jim Collins particularly in his book Good to Great: Why Some Companies Make the Leap… And Others Don’t talks a lot about the concept of getting the right people on the bus. You need to get the right people on your team and you need to get the wrong people off of your team before you really start driving it. So, if you’re in a position where you already have a great product, great service, you kind of have the customer experience over the product market fit. Tie it up and the problem is personality, sometimes you might not need to keep that person but on the other hand there’s always more you can do as a leader. So, you need to evaluate how are you compensating them, are you giving them the intangibles that any reasonable person would want such as autonomy to do their job well, trust, listening to their ideas and actually acting on them and trying to encourage engagement as opposed to just saying, “Well, you don’t know anything. So, we’re gonna pass on you.” There’s two sides, you can always be a better leader, you can always do more but at the end of the day you can’t make somebody want to get up and help your business grow. Yanique agreed with that point and stated that it’s something that we speak about a lot in their customer service workshops, leadership workshops that attitude is something that comes from within and you can bring in the greatest trainers, the most expensive consultants, the best of the best that the world could ever provide. But at the end of the day if that person is just not wanting to do what you want them to do then you aren’t going to get much further. Kenneth shared that right now they have a pretty small team and they’re really tight knit which is convenient if nothing else. But also, practical and great and all those things. As a startup they just a few months ago hit the milestone of a Million Dollars in annual recurring revenue. And so that’s very exciting by itself. But they also have what he thinks is a really good plan in place to at least double that in the next 12 months. So, that’s exciting, he’s more intrinsically motivated but that helps him wake up in the morning. Kenneth shared a quote from William Faulkner, he was actually joking with one of his writing buddies and wrote in a letter and said, “I only write when I’m inspired. Fortunately, I’m inspired every morning at 9 am.” Kenneth loves that because a lot of times he finds that the discipline or the habit is more important than motivation or whatever challenge is going on. If you wake up every day and you say, “Okay, I’m up, here’s what I’m going to do towards my work, my goal, my passion.” It becomes a lot easier to just do the work but to see results over time.